What To Look For When Buying A Skateboard? How to Choose a Skateboard for Beginners? What Size Skateboard for Beginner? Best Skateboard for 7/8/9 Year Old Beginner? Best Cruiser Skateboard for Beginners? Best Skateboard to Learn On? Skateboarding has become a very popular means of transport over the years. 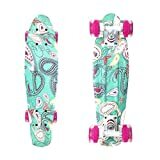 Skateboards are great, no matter if you’re a student looking for a product to help you get around, a mother of two or just a skateboarding enthusiast. Getting around can be tricky, especially if your city is packed with traffic and fumes, and you don’t want to add to the problem. If you don’t mind cruising on the side of a pavement or a relatively clean road, skateboards can be a great way to have some fun and experience a new hobby. We want customers to be satisfied with their products. That’s why we have spent countless hours researching and picking the best skateboards available out on the market today. If you are a beginner and need a well-versed opinion on the topic, we sincerely hope that our reviews and FAQ sections will help you decide which skateboard you should adopt as your own! Read on for our complete skateboard buyers guide where you can find things to consider when buying a beginner board, beginner skateboards for adults, ABEC ratings, Sizing Chart, and more about these epic extreme sports. Looking to go electric? Check our our review of the top electric skateboards! You could also try these top-rated electric longboards. Powell Peralta is a brand that has been around since the late 1970s. The Powell Golden Dragon has been on the market for over four decades now, and its popularity hasn’t decreased. It’s easy to see why even legends like Steve Caballero recommend these skateboards. Powell is known for having boards that fit every age range and skill level, satisfying the needs of many. It’s also probably the reason as to why the product is surrounded by 5-star reviews. Powell Peralta has gained increasing popularity in the 1980s, when skateboarding became an increasingly more sought-after action sports. Since then, they have been developing skateboards tailored to customers, taking reviews and critiques into consideration every time they were building a new model. The Powell Golden Dragon is a direct result of such careful consideration and tailored-modeling. Powell Peralta are known for their eccentric and original designs. This board, in particular, is covered with a black and red dragon. A design that will surely make just about anyone excited to ride! The board is about 31 inches long, the skateboard deck shape is 126 and the width is about 7 inches. The wheels themselves are about 54mm by 37mm. This skateboard is very durable thanks to the robust polymeric strap. Even if your board breaks, this strap will keep it together and keep you from doing the splits! The wheels are a surprisingly smooth ride and allow for fast and aggressive gliding. This can apply to people who weigh up to 200 pounds! Despite the polymeric straps, and grip tapes, the skateboard is still very lightweight. The Powell Golden Dragon is priced very well. It’s perfect for beginners that are just looking to start out and need an entry-level, quality product to practice on. SkateXS has been widely known to be the best brand for kids that are looking to advance their skateboarding skills. These skateboards have been designed with children in mind. That’s why there are many customizable features that you can pick when purchasing this product. If you are an avid skateboarder and want to introduce your kids to skateboarding, or just a parent that has been hearing about skateboards for weeks now, you can safely pick this product by SkateXs to help your kids safely advance in their skateboarding skills. SkateXS makes skateboards for kids, but the quality of the product is just as high as skateboards for adults. Many parents report their children being incredibly satisfied with the product. The reviews are 90% positive, and it’s easy to see why so many family members and friends turn to buying this skateboard for their young ones. Read on for more to consider when buying a skateboard for beginners. SkateXS has made a very child-friendly design for their skateboard. It features a panda cover that is available in 8 colors. If you have more than one child that wants to skateboard, you won’t have to worry about the mixing up their equipment! This skateboard is designed specifically for kids, and that’s why the dimensions reflect that. The board is available in three size batches, mainly size recommended for ages: 5-7, 8-10, and 11-12. You may wish to look at penny boards or mini cruiser skateboards for young kids. The SkateXS Panda is a very sturdy and environmentally friendly product The bamboo that it’s made out of offers a lightweight skateboard that the kids can easily carry around. As a result, if the skateboard ends up falling on the child, it should not cause any damage. SkateXS has provided this skateboard with many choices. Mainly, the various color options and the option to put the name of your child on the skateboard itself. The Skateboards grip tape is excellent and the overall quality of this board can be compared to that of quality adult boards. Even though this board may seem expensive for some, it’s a small price to pay if you want to keep your child safe! Krown has been producing skateboards since the late 1990s, which was the time when skateboards lived through a revival and became a popular hobby once again. Since then, Krown’s goal has been to create quality skateboards with budget prices. This has made Krown skateboards well sought after among beginners who want to try out extreme sports, and need a starting board. Even though Krown started out selling only skateboards, they have evolved to also sell longboards, pads, helmets and the alike over the years. The diversity of Krown makes them a reliable brand, and that’s why the Rookie Checker is one of their most popular products. It provides the riders with sturdy, durable craftsmanship that many customers are looking for when buying a budget skateboard. Krown’s skateboard is available in 7 checkered colors. It’s a great design for anyone that is looking for a board that both looks and skates well. The Checkered Rookie has dimensions of 7.75” x 31.5”. It’s ideal for any beginner that is looking for a well-sized skateboard. It’s narrow and lightweight, which makes it great for cruising. Krown made this skateboard from heavy-duty aluminum with an 80 skateboard grip tape. This helps you skate safely, not worrying about the durability of your product. Thanks to the modern concave design that allows for more pop, this skateboard is perfect for helping you learn all kinds of tricks. The Checkered Rookie is by far one of the cheapest products on our list so far. That’s why it’s one of our top choices when it comes to buying budget guitars! Founded in 2008 in Pennsylvania, Punisher’s goal has been to make graphically pleasing skateboards that have designs that resonate with the rider on a deeper level. Each artist is handpicked by Punisher to design an original, unique image that is then incorporated into the skateboard. The fantastic graphic designs combined with the quality of the skateboard itself make for a very personalized riding experience. If you are looking for a skateboard that will provide you with all the necessary features you need to ride safely and efficiently, then the Punisher Butterfly Jive will be the perfect board for you. No matter if you want to give this skateboard to one of your kids or if you want it for yourself, it has the perfect size to fit just about anyone. This makes it very versatile, and is able to be used by nearly every age range. The geometric design here is ideal for both boys and girls. With all of the yellows, blue, whites and greens within the pattern, you can rest assured that this is one of the most unique skateboards out on the market today. The Buttefly Jive measures around 32 x 14 x 9 inches and weighs about 7 pounds. Being made out of Canadian Maple, this skateboard is both lightweight and durable. The maple skateboard is known for having good endurance qualities and for being flexible. This helps the rider perform many tricks easier, and riding on more bumpy roads is made smoother. The concave deck shape allows the skateboard to be ridden by riders weighing up to 200 pounds. It also helps ensure that your feet stay firmly on the board, being positioned at an appropriate angle. The Butterfly Jive has the perfect price for anyone that is looking for a durable skateboard. It has a great design and wonderful craftsmanship for the price. Founded by the pro skateboarder Marc Johnson in the year 2000, enjoi has been on the market for over two decades now. They have since expanded, and started producing skateboarding accessories and clothing apart from just skateboards. Since then, they have adopted a panda as their logo. This logo is featured on most of their products and has quickly become the company’s trademark. If you are looking to buy a reliable skateboard that will keep you busy for years to come, the Whitey Panda is the ideal choice. It’s a very good entry-level skateboard that can be put through a lot of wear and tear. The solid, metal skateboard trucks ensure that you will be kept sturdy and safe both on and off the ground. This helps the rider feels more confident when doing tricks, no matter where they are. With their unique, geometric design of a panda placed on the back of the skateboard, you can easily see how proud enjoi is of their logo. The board itself is simply black and white, with red/black/white wheels. The dimensions of the Whitey Panda are about 7.75 x 31.5″, which makes it a perfect entry level skateboard. It’s perfect for both beginners, kids and adults alike, making it one of the most versatile boards out there. Made of Canadian maple, the Whitey Panda skateboard is a solid construction. The specialized resin glue holds everything together perfectly, making a durable and sturdy board to practice on. The core of the skateboard trucks is extremely lightweight, compared to the other skateboards we listed. They still sport a heavy-duty aluminum, but their initial design helps the skateboard be lighter and easier to pivot. It also arrives un-assembled which allows for the adult or child to have a sense of accomplishment when they put the board together. You will also be able to customize it to your heart’s content! The Whitey Panda skateboard has a very reasonable price for an entry-level skateboard. This is a skateboard that will allow you to have safe and balanced street skating experience as a beginner. Check out the top skateboarding shoes here. Powell has made sure to provide their customers with more than one design of one of their most sought-after skateboards. The Golden Dragon 2 is very similar to its predecessor, the Golden Dragon and is just as reliable as its sister model. When it comes to skateboarding, you can’t ask for a better board than the Golden Dragon 2. It’s durable, firm and thanks to the concave skateboard deck design, will allow you to do many tricks. Tricks, that other boards could possibly not support as well. The Golden Dragon 2 can also reach very high speeds thanks to the smooth ride skateboard wheels that have been incorporated into the design. Many people report this skateboard to hold up very well, even after several seasons and years of use. 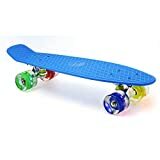 This makes them perfect skateboards for adults and kids that are looking to use the board very regularly for practice purposes. The design on this skateboard is just as attractive as the design features on the Golden Dragon’s 2 sister model, the Golden Dragon. This particular design, boasts a menacing-looking dragon that peers out of black flames. The sizing of the Golden Dragon 2 is about 31 x 7.5 x 6 inches wide, which is perfect for both adults and children (usually over 8). Many people have stated that they have used this skateboard relentlessly for years, and it still holds up its wonderful craftsmanship. Powell is definitely a reliable, quality brand that will allow you to enjoy riding for a long time yet. Having been on the market for over 35 years, Powell has developed the features of their skateboards to near perfection. The struts on this board are metal, allowing for heavy duty riding and holds up well. The Golden Dragon 2 has the perfect price for anyone that is looking for a budget-friendly skateboard. Just like our previous skateboard, also produced by Punisher, the Elphantasm looks just as attractive as its sister model, the Butterfly Jive. Both have very outgoing designs that can fit the style of skating for many riders nowadays. The highly artistic image of this skateboard is, as Punisher states, one of its main attractive features. Combining the high-quality design with the quality craftsmanship of the Candian Maple deck has been one of Punisher’s better choices. It makes this board one of the most durable skateboards out there. When purchasing this skateboard, there is no assembly required, and the high-speed skateboard wheel bearings will allow you to go faster than your peers. If you have wanted to get your hands on a skateboard that will help allow you to perform tricks and ollies, the Elphantasm is ideal for you. The Elephantasm design of the Punisher skateboard is one of the more original designs on the market. The bright, pastel colors of the geometric elephants on the back cover help this board to stand out among the others of its kind. The dimensions of the Elephantasm are about 32 x 14 x 9 inches wide, which makes it the ideal board for taller adults or teens. Thanks to the all maple deck, this skateboard can endure a lot of beating and wear and tear. If you are just beginning your skateboarding adventure, purchasing this board can be a great idea. It’s designed especially for the apprentice rider, that will be putting the board through a lot of abuse. Punisher is known for paying a lot of attention to the tiniest details of the design of their boards. The Elephantasm is no exception. The function and form of this board are unmatchable, and it glides down the road without a problem. The Elephantasm has the perfect price for any beginner skateboarder. If you are looking to invest in a product that has both quality design and build, this is the one! If you are eager to have a new skateboard and need to take into consideration your budget, then Landwalker’s skateboard is the prefect board for you, based on personal preference. It’s by far one of the cheapest products on this list, while still giving you sufficient endurance and quality performance. Thanks to the high-density wood, you can rest assured that even if you fall, your skateboard will remain to be in one piece. Preassembled completes are ready to take out onto the road. Landwalker’s goal is to provide sturdy skateboards, that are affordable and that won’t break easily. We can safely say that they succeed in fulfilling their motto. The skateboard is surrounded by 5-star reviews all around and is an Amazon’s Choice product. This should convince any wavering customer to grab this skateboard quick! Landwalker’s design focuses on a witty, rainbow-checkered design. On the pattern we can see a pug dressed in skateboard pads and a helmet. If you like skateboards that carry a funny message, to show off your personality, then Landwalker’s design is perfect for you. It also comes with a green cover and a panda design as an alternative option. The Landwalker Pro Cruiser is ideal for adults and kids (over 10) alike. Its dimensions measure around 31 x 8 x 6 inches, weighing in at about 5 pounds. The heavy-duty Canadian Maple makes this board one of the most durable boards out there. Crafted with the 8 layer system, the density of this skateboard will ensure that you won’t be breaking it anytime soon. The concave design helps you gather more speed, making kicks and tricks easier to manage. This helps ensure that you have your feet positioned well, giving you proper posture to develop good habits. Landwalker’s skateboard has the perfect balance between a good price and good riding quality. The materials used when building this board ensure that it will serve you for years to come. Krown Rookie complete skateboards are a prime example of a product that is well liked, and of great quality. Just like with the previous Krown product we discussed, the company has given us several colors of the product o choose from. This is a great addition, since it helps riders personalize their rides whichever way they want. It also limits the possibility of running into someone that is sporting the same skateboard at you! Krown’s motto is to provide quality skateboards on a budget. They manage that surprisingly well; not only are their products at budget prices, but they can take quite a lot of beating too. Their skateboards arrive readily assembled and ready to ride. You won’t have to spend hours fiddling with screws and bolts to ride your new prized possession! No matter if you are a beginner or an expert looking for a good board to ride on, Krown’s product is made to fit everyone’s needs. Krown’s board design is simple, but speaks a thousand words when examined closely. There are flames on the two opposite sides of the board, available in 6 colors. If you are fussy about what your skateboard looks like, then Krown will surely provide you with enough suitable options! Krown’s skateboard measures around 7.5-Inch x 31-inches wide. It weighs about 4.5 pounds, which makes it a great choice if you don’t want a big, heavy skateboard falling down on you. The Candian maple construction helps the skateboard be a durable alternative to the more expensive boards out on the market today. The aluminum trucks help ensure that your board won’t break anytime soon, and the skateboards grip tape allows you to stay on your board firmly at all times. The board is professionally assembled for pro skateboarders, and you can rest assured that each component of the designs meets industry standards. Krown also included a modern concave design to help encourage comfort when skate park or street skating. Being the cheapest skateboard on our list yet, it’s ideal for those that are looking to see if they want to have skateboarding as a hobby. Punisher’s Cherry Blossom skateboard is really one of a kind. Not only does it come with a high-quality, durable pro deck, but it has a perfect price for a beginner skateboard. If you have been meaning to try out skateboarding for a while now, this is the best skateboard to start with. It has a quality craftsmanship combined with a budget-price, making it widely available to the general public. The heavy-duty design makes sure that you will get all the best features from this board. Features that can usually only be noticed when buying more expensive products! If you are looking for a safe ride that will help you develop your skills further in our buying guide, look no more. Punisher’s Cherry Blossom skateboard is the ideal choice for any enthusiastic beginner. All of the patterns and designs on this Cherry Blossom board are custom painted. They are directly applied to the wood and are not a sticker, which usually falls off and gets damaged within a few days. The design is akin to the Sakura Blossoms that are common during Japan’s summer season. The board is about 31.5 x 7.75 inch, which makes it the ideal size for kids (8+) and adults alike. The Cherry Blossom can take up to 220 pounds of weight, which makes it a very versatile board. The grip tape is particularly durable and can help you improve your tricks, thanks to the traction provided. This will give you the ultimate control over your cruising. Krown’s skateboard is the perfect example of a good product together with a good price. Krown’s goal has been, ultimately, to provide more for less. Buying your first skateboard can be a very exciting process. There are hundreds of designs to look through, and thousands of colorful, witty designs to choose from. Each skateboard is different, and has different features. Some boards are perfect for cruising, while others are made to endure a lot of batter, ollies, flips and slips. First off, it’s important to decide what you will be using your skateboard for and what you will be doing with it. That’s why it’s important to ask a few key questions: Are you going to be using it every day? Is it for a new hobby? Is it for competition practice? What surface will you be skating on? Will you be partaking in park skating, or street skating? When you have answered these questions, we can move on to the main features of the skateboard. We will discuss how they are relevant, and why it’s important to take them into consideration. This will ultimately help you decide which features are best for your particular skateboard of choice! Skateboards are known for having witty, eccentric designs. This means that are dozens of possible patterns and designs to choose from. Each company has their own trademark. For example, enjoi is known for their panda logo, and they make sure to include it in a lot of the skateboards they make. Knowing what kinds of designs you gravitate towards will help you make an easier decision. Krown is known for providing their customers with a lot of color options. They are one of the companies that can give up to 10 various color choice for one design, no matter how intricate. To help you decide what designs you like most, we included various patterns and printings in our review section. From cherry blossoms to fiery dragons, from checkered boxes to padded pugs, there is a lot to explore. You have to remember that you will be using this skateboard for years/months to come. Therefore, it’s important to choose a design that you think is cool, not a design that will look cool to others! Skateboards come in a lot of various sizes. Some are meant for kids only, while some are able to be used only by adults. There are also skateboards that suit both adults and children over 8-10 years of age. For example, regular skateboards are around 7.5” x 31”-8.5” x 32.5”, while skateboards for children are commonly sized 7”x28”. This ensures that young kids won’t be overwhelmed with the design of bigger skateboards from this buying guide. It also helps children ease-in into the skateboarding world, allowing them to see if it’s the right sport for them at an early age. Choosing skateboards that are made out of good, sturdy, and durable wood is vital. Most boards nowadays are made out of Canadian Maple. The skateboard deck is usually made out of a dozen or so layers. This ensures that your board will be reliable and can take some beating when you fall off or start doing skateboard tricks. You should also look for pro boards that have metal skateboard trucks, since these are the ones that support decks best. You should also look for the type of skateboard wheels that you will be getting with your skateboard. Soft wheels are great for cruising around uneven surfaces, while harder wheels are better for skateboard tricks and hard falls, which is vital for various skateboarding styles. The key thing to remember is the smaller wheels are slower, and bigger wheels are faster. That’s why it can be important to look at the diameter of the wheels before you buy them. This can help you choose the perfect board for you, or help you decide if you can exchange them later. If you are having trouble mix and matching wheels with your new board, there are plenty of chars online that do the math for you! From grip tapes to warranties, many skateboards come with their own sets of features. Some are equipped with extra wheels, while others come with cleaning kits. It’s a good idea to pay attention to what extra accessories and/or products the company offers you during your purchase. Some boards come with pads, or helmets and some don’t. It’s important to pay attention to the features of the product you are interested in, since you may need to buy all of the safety gear separately, such as a skateboard helmet, slide gloves, elbow pads, a shock pad, wrist guards, and more. Beginner skateboards can vary in price. They can range anywhere from 150$ well down to 35$. It’s all a matter of searching for the best candidate. It’s best to narrow down your budget before you go to search for your ideal skateboard. Narrowing down how much you will spend will help keep your shopping within a budget price, ensuring that you won’t spend more than you can. Especially since spending more can be tempting, when you see all the attractive designs and shiny looking boards! Unfortunately, there is no one skateboard that is ideal for beginners, and choosing Skateboards for them can be difficult. Learners come in different sizes, weights and heights, and that’s why it can be difficult to generalize. It also depends on what you want to do with your skateboard as a beginner, and whether you will be using it for cruising, tricks or both. Regardless, there are a few guidelines that can help you decide which beginner skateboard is perfect for you, all of which we listed above and below! 7.5” to 8” skateboards: These are the standard boards that are most commonly used by adults. They are perfect for cruising and doing more advanced skateboard tricks. 8.0” to 8.25” skateboards: These boards are ideal for skate park-use, where you have ramps and other obstacles to go over. 8.25” + skateboards: These boards are perfect if you want to feel the old school skateboarding vibe. They are great for cruising due to the stability they provide, and extensive ramp/skate park use. SkateXS is a very popular brand among parents that have kids that are enthusiastic about skating. They have a variety of skateboards, plenty of color choices and even add a name tag of your child on the grip tape. This helps the child feel like they have full control over the board and its development. This, in turn, will make them treasure it more. SkateXS has custom skateboards for kids of every young age. From ages 5-7 we have skateboards sizes 7” x 28”. For kids between the ages of 8-10 we have skateboards sized between 7.25” x 29”. These are the perfect sizes for young kids, since it helps them feel less overwhelmed by the board. It also helps provide them with a board that is ideal to their side, encouraging safe cruising and skateboard tricks. Best cruiser skateboards include large wheels, since they offer you both stability and speed. They usually have much softer wheels than the regular skateboards you use for doing skateboard tricks and ollies. A good beginner cruise skateboard for beginners can be the La Sports Retro board. It has a simple design and is surrounded by 5-star reviews all around! Many customers report it feeling sturdy and firm, while going at very good speeds. It’s best to not go overboard with spending a lot of cash on your first skateboard. After all, it will take a lot of beating, and will surely be reduced to looking like a scratched plank of wood! Best skateboards to learn on include budget, beginner skateboards that offer you all the quality features a more expensive skateboard would, but at a lower expense. If you are new to skateboarding, it’s also recommended to get a skateboard with smaller wheels, since they go slower and are less intimidating! Skateboards have been gaining an increasing popularity since the end of the 1990s. Since then, it has been a common hobby and form of entertainment for many. However, due to the popularity of skateboards now, it can be hard to find a reliable and quality product. There are plenty of skateboards out there that will break easily when placed on harder gravel. That’s why we made this article, the list and the information sections, to help you choose the best product for you. The best thing you can do is go to a local sport’s shop, look at the skateboards; determine which size fits you best. Then, you can go back to looking at online products and safely choose a good candidate. This way, you will be able to have a product that fits you both design and cut-wise. There are many quality brands out there that offer quality products, and we hope that you pick a skateboard that will be able to accompany you for years to come! You are going to fall. A lot. Especially if you are a beginner, and that’s why it’s recommended to wear protective safety gear for skating, such as knee pads and a skateboarding helmet. Skateboarding was invented in the 1940s, when the people of California wanted something to do when they couldn’t surf. Originally, skateboarding was called ‘sidewalk surfing’! Skateboarding is now a very popular form of transport as this study shows. Next articleShould I get a Skateboard or Longboard?